These conditions are the requirements for guests travelling with dogs. The dog owner must agree that the Park Manager reserves the right to evict any guests whose dog is deemed noisy, disruptive, and aggressive or the subject of a complaint/s from other guests. It is the dog owner’s sole responsibility to control and manage their dog. If in the view of park management this has not happened to an acceptable level, the owner and the dog may be evicted from the park immediately. Upon arrival at the park, the dog’s acceptance will be at the Manager’s discretion. 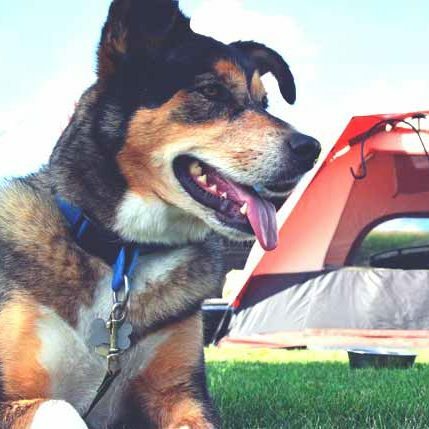 Dogs must be supervised at all times and never left unattended, including inside a tent, van, or other accommodation. Dogs must be on a leash at all times while not in a van or tent or other accommodation: there are no exceptions. For health and safety reasons, dogs are not allowed in any common areas of the park, such as the amenities, swimming hole and picnic areas. If your dog would like to go for a swim please take them down the stream. Dog owners are 100% responsible for picking up and disposing of their dog’s waste in a plastic bag and disposed of in rubbish bins. Bags may be purchased from the Kiosk. For health and safety reasons, dogs must not be washed or cleaned anywhere within the park. Dog owners are personally responsible, and will be held to be so, for any and all personal injuries and/or property damage or losses in relation to any actions caused by or because of their dog.